Helpful tools when on the lookout for birds. 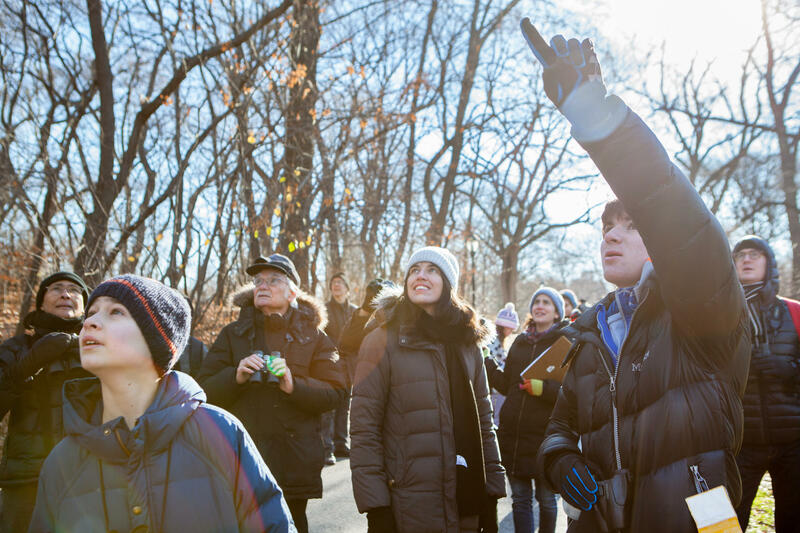 Counting birds at dawn during the Christmas Bird Count guarantees you’ll see lots of them—which can lead to confusion. Especially if you get into a big flock of robins or grackles; you just have to start estimating numbers. But, it’s really fun when you start getting big numbers of species. You know, you’ve only been out for an hour and you already have 30 species of birds; that’s really fun. 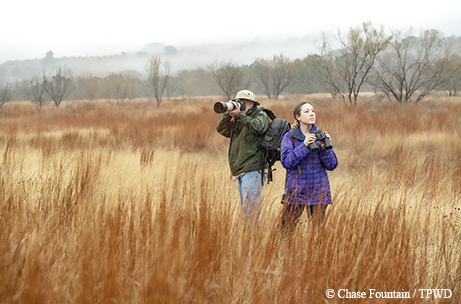 Cliff Shackelford is a non-game ornithologist with Texas Parks and Wildlife. This year’s count is December 14 through January 5. There are over a hundred Christmas Bird Counts in Texas; so, chances are there’s one in existence in your area. Counts take place in 15-mile diameter circles. Find a count circle at audubon.org. Search for Christmas Bird Counts in Texas, and figure out which one is nearest you. Also, you’ll see who the compiler is, and you can get phone number or email and start coordinating with that person. Compilers act as “captains” of their circles, and relay collected data to Audubon, which organizes the event. 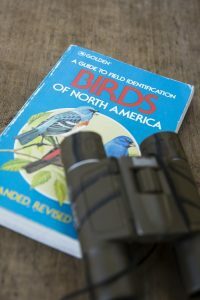 Birders of all skill levels are welcome. And what they’ll do [if you’re a novice] is stick you with some seasoned vets, and that’s really good because you learn a lot when you’re out in the field with someone whose been doing this awhile. So you go out with this team of observers and you basically beat the bushes and try to see as much as you can see. It’s a lot of fun. The data helps researchers better understand trends as they relate to our feathered friends. The WR restoration program supports our series. 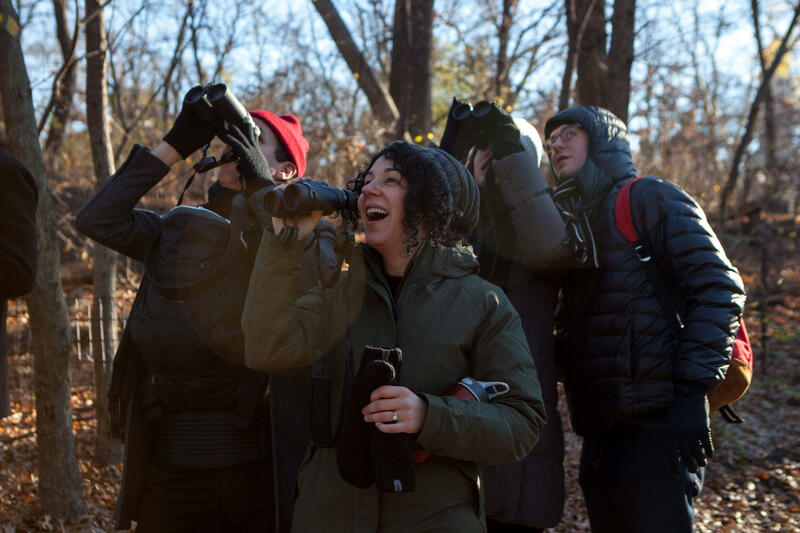 Participating in the Christmas Bird Count. The name “Christmas Bird Count” is a bit of a misnomer. It doesn’t happen on Christmas Day. It happens in a period around Christmas. That period is December 14th through January 5th. You just have to pick a day in that three week period to do the count. Cliff Shackelford is a non-game ornithologist with Texas Parks and Wildlife. Counting occurs in 15-mile radius circles; people participate in groups or teams, directed by a compiler. And those people [compilers] decide on a day, and they divvy up the pie of where these teams can go look for birds in this fixed radius circle, and you count birds within that circle. Volunteers count species during a 24 hour timeframe – midnight to midnight on the chosen day. You don’t have to. But, a lot of people want to know about owls [for example]; so, they get up early. Three A.M., maybe, and go listen for owls. And that’s pretty valuable. But, most people do just the daylight hours. Cliff recommends getting out at dawn. That’s when you get the best bird diversity at dawn. Everybody’s waking up: singing, calling and foraging and activity is the greatest right at dawn. Because, birds have slept all night and they’re hungry for something to eat. 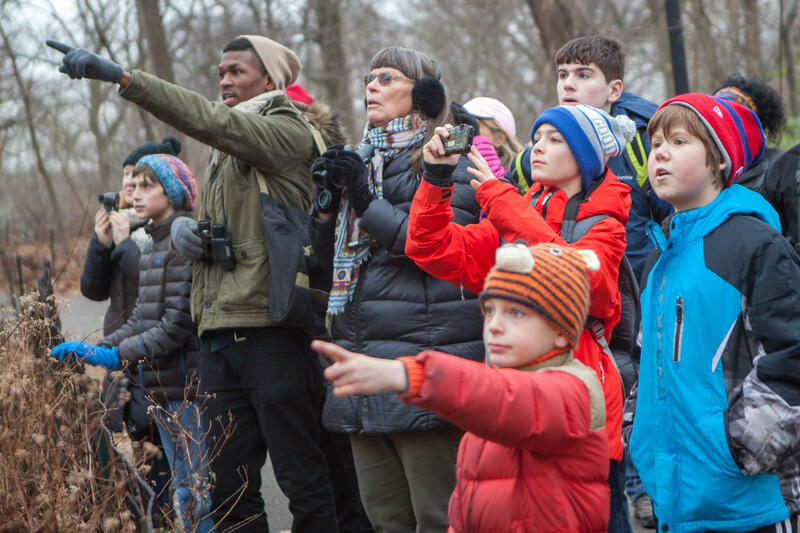 Find a count circle near you at audubon.org. The Wildlife Restoration program supports our show. 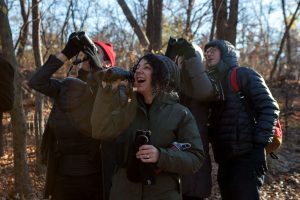 Christmas Bird Count participants. Image from Audubon.org, by Camilla Cerea. The National Audubon Society’s annual Christmas Bird Count began December 14 and ends this Friday—the last day to collect data. Teams of birders go in the circle and they repeat that every year. So the circle never changes. And after decades, you have some really neat data to look at. More than one-hundred, 15-mile diameter counting circles dot the state. Cliff Shackelford, non-game ornithologist with Texas Parks and Wildlife, says circle organizers, called compilers, choose one day during the 3-week timeframe where observers tally species over a 24-hour period. Some of the circles with few observers, [those people] cover that whole area in that circle. Some of the circles that are in really populated areas with lots of bird watchers like down on the coast, they’ll break up that circle into piece of pie: ‘And this is your piece of pie. You stay in this section and you count all the birds you can.’ If you want to get up at midnight and start counting one minute later, you can look for owls. Or listen for owls. It’s a 24-hour counting period per circle. What happens to the collected and compiled data? We use information from the Christmas bird count to determine where hot spots are for wintering species. And with that knowledge researchers are better prepared to provide these birds with what they need to thrive. You are currently browsing the archives for the Christmas Bird Count category.